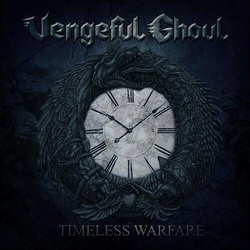 Vengeful Ghoul is a Turkish band that has been around for about a decade now, but have finally gotten their debut full length CD released. I am guessing that this is partially due to their non-metal surroundings as Turkey is not exactly known for it's heavy metal scene. The band is pretty much labelled as a thrash band, but there is a lot on this CD that makes me think of them more as a blend of thrash with some US Power Metal as well. Ruthless Crow sounds like Cage or Seven Witches more than a true thrash band. The band does a really good job of mixing a lot of different sounds together into their music. The aforementioned power metal as well as some very slow but heavy music as seen on My Crowded Soltude and straight up thrashy numbers to boot. The production is solid, but definitely has the self-produced feel to it, but that does not take anything away from the music and if anything gives them a real heavy metal spirit to the music they have put out here. Emre Kasapoglu has a very strong vocal delivery, showing he can sing soft and soothing or he can deliver the best power or thrash notes with a mix of a high pitched screech or a deeper and grougher vibe as called upon for the music, all with a very minimal accent to distract from the music. This is on top of the twin-guitar attack and insane drum pounding that just makes this music a complete package! Top picks on this CD would include Chained Freedom, Ruthless Crow, My Crowded Solitude, Under Control, Search For Apeiron and Timeless Warfare. I don't really get into every track on the album, but there is a lot on here that I do like. Just one more testament that heavy metal will endure no matter what the climate! !